I tend to listen to documentaries while I work. Some people might find this obnoxious or distracting, but I find it both entertaining and relaxing. And informative! I’m a facts sponge, I live to soak up interesting information. The lives of medieval children based on archeological evidence. The evolution and manifestation of ideas about deity through Western History. The secret world of Haute Couture and its clientele. The AIDS epidemic with the US’s African American communities. Life and teaching of the Buddah. Child brides within the opium trade and terrorist networks. The connection between refuse and waste disposal and civic unrest. I’m either very deep or secretly shallow. Two of my favorite documentaries of all time are Prohibition, by Ken Burns, and The September Issue. Make of that what you will. But I’m asking you to confuse my tastes even more. I’m putting out another call. You responded magnificently to my plea for book recommendations, so now give me your favorite documentary titles and/or subjects. Tell me what I need to listen to or watch next. 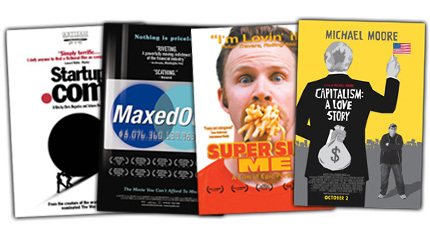 I LOVE watching documentaries…looking at your list I TOTALLY want to go check all of those out! Warning, most of what I watch is PBS…so…be prepared. Of course anything by Ken Burns is brilliant and I especially love the Civil War, but I haven’t watched Jazz yet and I’m guessing that will ACTUALLY be my favorite. Mom and Dad prefer The War. Nature — every week. Because pretty pictures, and animals. My favorite was one about the Monterey Bay Aquarium and their great white shark exhibit. Oh fellow PBS watcher – you are of my tribe! These are great! I’m unhealthily obsessed with Air Crash Investigations, Mayday, Seconds from Disaster, Aircrash Confidential, and every other Nat Geo/Discovery series about plane crashes. And I’ve probably seen every 9/11 documentary ever made, and all the “real time” compilations. I also watch the ones about people who disappeared…and natural disasters. Tragedy and devastation. Also, documentaries about the Vaganova school or specific dancers there or in the Mariinsky or the Bolshoi (when I’m not watching performance/class videos). And Olympic gymnasts. The day I find an Air Crash Investigations episode about a plane full of Vaganova girls and the 1976 Romanian women’s gymnastics team crashing in the middle of a hurricane because of terrorism and the survivors are kidnapped and never found, I am seriously turning off my computer when it’s over because there will be no way to top that documentary achievement. Especially if everyone is watching Osipova’s 2005 Kitri “Desafio” when the crash happens. I feel like it’s really easy to understand my choices as a writer based on my youtube viewing history. Babies was a good one, even if you don’t love babies. Bully was heartbreaking but worth watching. Anything by Nat Geo is a goodie. When We Left Earth is a series about the Apollo project, and Deg and I really enjoyed that one, too. I like babies selectively, yours in particular 😉 Seriously, I’m awfully proud of his forthcoming Christmas present. I’ve heard that’s a good one so I need to add it to the list. When We Left Earth sounds fascinating!